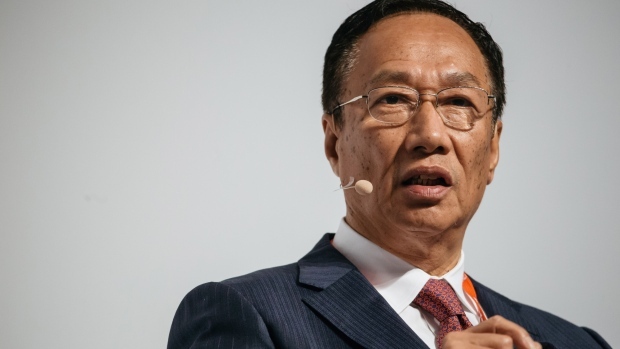 (Bloomberg) -- Billionaire Terry Gou’s possible entry into Taiwan’s presidential race illustrates the dilemma facing the island’s leader, Tsai Ing-wen, as she prepares for an uphill re-election bid. On one side, Tsai must contend with a resurgent Kuomintang, advocating closer ties with China and eager to regain power after three years in the opposition. On the other, she’s battling a nomination fight within her own Democratic Progressive Party, where her pro-independence base is pushing for a cleaner break from the mainland. Gou’s potential challenge, which the Foxconn Technology Group founder said Tuesday he was considering, represents the broader problem for Tsai. A series of tough policy fights and an isolation campaign by China have pushed support for her reelection into the teens in some public opinion surveys and encouraged several would-be contenders from among the more China-friendly “pan-blue” camp. Gou, who says he would run on the KMT line, was one of the first Taiwanese business leaders to take advantage of cheaper wages and land costs on the mainland, becoming Apple Inc.’s top iPhone assembler. His resources -- including a fortune worth $4.4 billion, according to the Bloomberg Billionaires Index -- could pose a formidable challenge to Tsai. But first, the Taiwanese president must survive a primary challenge from her former premier, William Lai Ching-te, a self-described “independence worker” who has pledged a firmer push-back against China. That’s forced Tsai to shore up her base, cracking down on mainland investments, visitors and other potential sources of political influence. One possible solution for Tsai would be to convince Lai to join as her vice presidential running mate. But polls show him running more competitively against possible KMT candidates than Tsai and the DPP has delayed primary after late May to allow more time for negotiations. In the mean time, Tsai’s government has raised the top fine for illegal mainland investments to NT$25 million ($800,000) from NT$600,000 previously and removed a communications regulator accused of failing to clamp down on false reports benefiting China. Earlier this month, Taiwan deported a mainland academic Li Yi after he tried to deliver a speech on unification while on a visit to the island. She’s also held a series of events with China hawks in the U.S., in which she’s sounded the alarm about Communist Party “coercion” and urged greater military support from Washington. The race comes against the backdrop of increased pressure from Beijing, with President Xi Jinping suggesting earlier this year that mainland China and Taiwan should enter into “in-depth democratic consultations” on unification. The risk for Tsai is moving so far toward her base that she cedes the middle to a KMT challenger. Besides Gou, former New Taipei Mayor Eric Chu and former legislative Speaker Wang Jin-pyng have announced their candidacies. Han Kuo-yu and Ko Wen-je, the outspoken mayors of Kaohsiung and Taipei, respectively, also haven’t ruled out a run either. Improving China ties has been a unifying theme among the pan-blue contenders. Han has described China and the island as two partners in an “arranged marriage” who had fallen “madly in love” and said that peace talks were “inevitable” between the democratically run Taiwan and the Communist Party-ruled mainland. Gou’s personal story as the child of mainland emigres who made a fortune in China echos Taiwan’s own economic dependence on the much larger economy next door. That might appeal to Taiwanese voters. Public opinion polls show they favor continuing the island’s ambiguous status without immediate independence or unification.